MB 2 M.K.B. Batt. 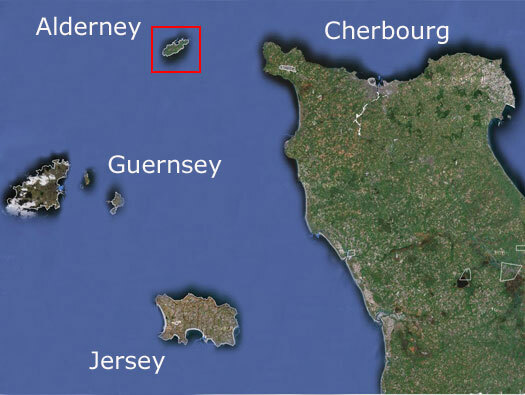 Annes, Alderney. Les Iles Anglo-Normandes. 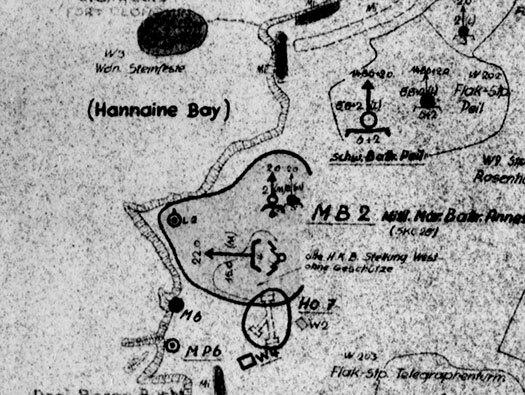 German map of the island and its defences. 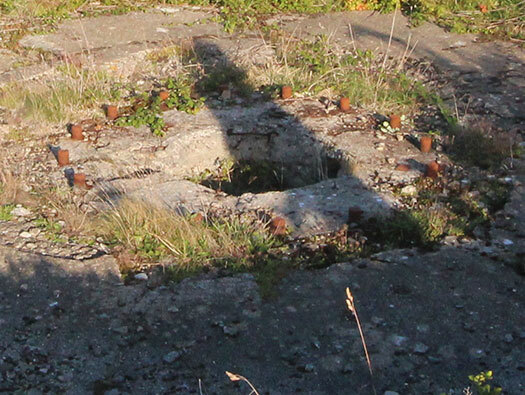 4 x 15cm SK C/28 guns open emplacements. 4 x hexagonal gun positions (Bettung). 3 x four barrelled 2cm Flak. 1 x 7.5cm LAG (anti air landing gun). 1 x 3.7cm Pak gun (may be the 7.5cm LAG gun??). 1 x M120 Fire control post for a 17cm batterie. 2 x 150cm searchlights field positions (Anton & Bruno). 5 x M151 quarters for 1 Officer, three NCO´s and 24 privates. 2 x M145 ammunition bunkers. For guns crew M151 quarters for 1 Officer, three NCO´s and 24 privates. Ausboustand-karte Alderney the German map of the batterie. Alderney, MB 2 M.K.B. Batt. Annes, road in. 4 x 15cm SK C/28 gun. M131 bunker for permanent machinery. Alderney, MB 2 M.K.B. Batt. Annes, trench bridge. A concrete bridge allowing heavy lorries to pass over a defence trench system. Trench layout and where the bridge is situated. The edge of the bridge with the trench running out into the fields. Alderney, MB 2 M.K.B. Batt. Annes, M145 ammunition bunker. This is a multi roomed storage area. All ammunition has to be carried by hand down into the bunker and then when needed carried back out. This bunker looks like it was made in Formstein concrete block. Bauform construction in a casemate. Alderney, MB 2 M.K.B. Batt. Annes, water reservoir. A lot of water would have been consumed by about 2500 to 3000 men or more that would have been here. Alderney, MB 2 M.K.B. Batt. 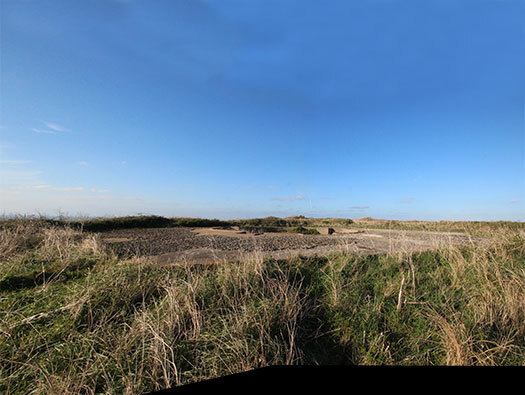 Annes, the second M145 ammunition bunker. The second large ammunition bunker..
6 x 2cm Flak 38. 3 x 2cm 38 Vierlinge [quadruple]. Alderney, MB 2 M.K.B. Batt. Annes, the secondM145 ammunition bunker. Steps down with a 200mm air vent on the side wall. The second M145 ammunition bunker. Smaller room for maybe flak 2cm or small arms or fuzes?? Alderney, MB 2 M.K.B. Batt. Annes, M151 quarters for one officer, three NCO´s and 24 privates bunker. M151 quarters for 1 Officer, three NCO´s and 24 privates. Alderney, MB 2 M.K.B. Batt. Annes, Turm 1. 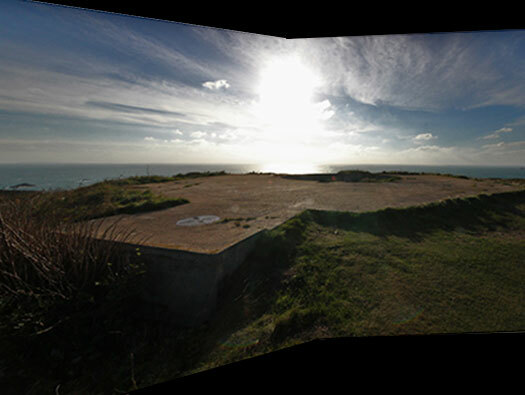 The first large gun emplacement with a trench leading into the emplacement. 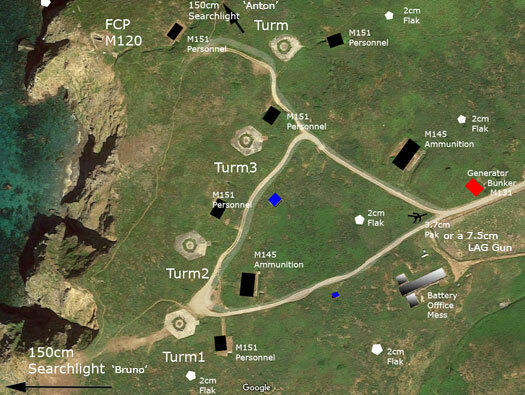 A very bad plan of the emplacement or Bettung. The trench entrance into the Bettung. The gun in its Bettung. There are three niches like this and three larger ones. These may be used for the cases to be passed up through?? The larger ones for the heavier shells. Another view of the hole..
Case with cordite to power the shell out of the gun. Another view of the hole. One more has a steel ladder down to the lower level which we did not enter. Steel type ladders that was used. Ammunition hoist, this is where the shells came up from the storage under the concrete lid. Alderney, MB 2 M.K.B. Batt. Annes, Turm 2. The concrete roof with a second layer of concrete camouflage. The centre tie downs for the gun and shell ammunition hoist. Trench entrance into Turm 2. Alderney, MB 2 M.K.B. Batt. Annes, ?? This is very interesting if only I knew what it was??? Alderney, MB 2 M.K.B. Batt. Annes, Turm 3. Alderney, MB 2 M.K.B. Batt. Annes, M151 quarters for 1 Officer, three NCO´s and 24 privates. This is the entrance attached to the gun Betting via a trench. In this trench is another odd item?? This is the entrance attached to the gun Betting via a trench. Tow large crew rooms for 12 men each. Officers room & a room for three NCO´s. Tobruk of weapons pit as a Tobruk would have had a round hole. This is another view of the other item I have no idea what it was for. Alderney, MB 2 M.K.B. Batt. Annes, Turm 4. About 17/18 threads with a hole in the centre to allow command wires to come up to the gun and steel ladder down into it. The base of an SK C/28 gun. Alderney, MB 2 M.K.B. Batt. Annes, M120 Fire control post. 1 x M120 Fire control post for a 17cm batterie. Attached by short trench is an M151 accommodation bunker for FCP crew. Although the FCP is for a 17cm batterie, here it is used with a 15cm batterie. In the nose - Observation room. passage way to - computing room. Wireless, ventilation, latrines & wash room. Middle rear - ventilation, gas lock, close combat. M120 large FCP bunker elevation. Obs, obs & rangefinder. Computing lower front. M120 two observation domes and one large range finder. 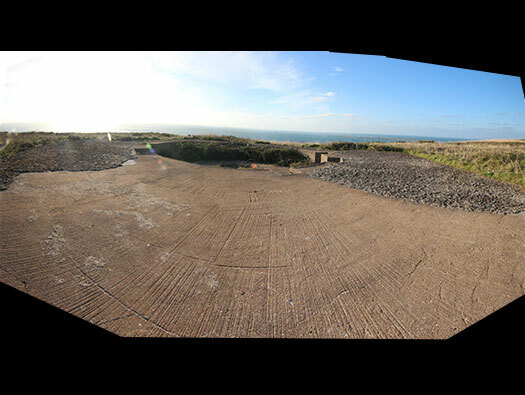 At the south side of the battery is an oblong sunken area which was dug out to place possibly a wooden long hut in it to use as a battery office/canteen/barracks, anything that was needed.. Wooden hut at Batterie York, Cherbourg..
A base for a wooden hut Margival showing what it may look like..
Alderney, MB 2 M.K.B. Batt. Annes.